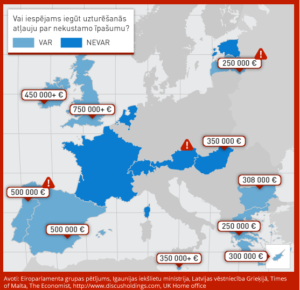 Latvia was nearby and the permit, at that time, was cheap by comparison to other European countries. To qualify, they only needed to buy some property in Latvia. And as long as they weren’t buying in the capital, Riga, or the popular seaside resort of Jurmala, they would only need to spend € 70,000 (US$ 80,000). They decided to use their savings and started looking. They fell in love with a new, completely fitted-out apartment in the small town of Cēsis about 100 kilometers northeast of Riga, but it was too expensive. They settled for Ozolnieki, southwest of the capital. For € 105,000 (US$ 119,000), they purchased a 94-square-meter apartment with a wide terrace near a forest and river, less than 40 kilometers from Rīga. It was twice as big as the family home in Moscow. They ordered furniture by mail-order from IKEA in Lithuania for € 5,000 (US$ 5,663) and bought good mattresses in Latvia. Bratislavskaya says they didn’t have any other large expenses – not for a nanny, gardener, security guard or even a car. 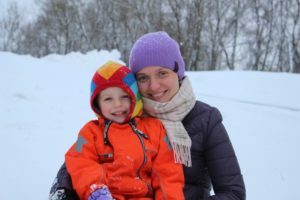 Since their purchase, they’ve spent about a month in their new flat as her husband’s employment is in Moscow, but eventually they hope to move to Latvia permanently. As it turns out, Bratislavskaya and her husband bought their Latvian flat just in time. In May 2014, lawmakers worried about the inrush of mostly Russian buyers raised the minimum expenditure needed to obtain a residence permit from € 70,000 to € 250,000, far more than the couple wanted to spend. Bratislavskaya and her husband are among the more than 13,500 foreigners who have either bought property in Latvia or put the money in the local bank which qualifies them for the residence permit that allows them to travel and live virtually anywhere in the European Union. At least 10,000 of the new arrivals are Russians. The arrival of so many foreigners has caused consternation among citizens and politicians, sparking intense debate over how or whether the Golden Visa program should be continued. The powerful lobby of the program has painted different investor than the most of the actual arrivals. This “average buyer” is a 43-year-old man, with a wife and children, from Moscow or another capital of the countries which made up the former Soviet Union. The property is usually registered in the spouse’s name and occupied for about six weeks per year. The average property is worth about € 142,000 (US$ 161,000). Immediately after the purchase, this average buyer spends another € 68,000 (US$ 77,000) for furniture and a car. Over the next year he spends another € 92,000 (US$ 105,000) in Latvia: at restaurants, hospitals, spas, salons, and shops, paying local people for services: hairdressers, nannies, security guards, gardeners and so forth. In total, each investor brings almost € 340,000 (US$ 385,000) into the Latvian economy; his annual income is € 768,000 (US$ 870,000). The “average buyer” is a fictional construct by the Deloitte auditing company based on a survey of 45 rich clients of Rietumu banka and ABLV, two banks which specialize in serving foreigners. By contrast, Bratislavskaya and her husband are real people, the kind of middle-class Russians who make up the bulk of those who have opted for Latvia’s residence program over the past five years. Surveys cited have been paid for by interested parties, with no independent research to compare with them. A second survey, commissioned by the Ministry of Economics, was paid for by the association headed by an influential businessman in the real estate sector, Latio owner Edgars Šīns). A powerful lobby with influence on members of Parliament cherry-picks numbers from those surveys, mixed with assumptions which favor the real estate business and the banks which cater to foreigners. The Deloitte survey was paid for by the Association of Latvian Private Banks. Its head, Oļegs Fiļs’s bank, ABLV Bank, services the largest non-resident deposits in Latvia. In the last three years, Fiļs and his partner Ernests Bernis, with ABLV Bank, have led the list of the most profitable companies in Latvia. The residence permits are an important part of that business. Deloitte’s portrait of the “average buyer” is favored by ex-politician Ainārs Šlesers and other lobbyists, as it supports claims about Latvia’s enormous economic gains from the sale of residential permits to foreigners. Conclusion: yes, but the figures are exaggerated. Plus, the money has ended up mainly in one sector – in real estate, creating long-term risks. “It was my initiative, and, as shown by the Deloitte survey, has resulted in a direct and indirect way in investments to the tune of € 2.1 billion (US$ 1.1-2.5 billion), which have now arrived in Latvia,” said Šlesers in an interview with NRA newspaper, some months after the publication of the survey in 2013. The advertising was paid for by Latvia’s Konkurētspējas Attīstības Fonds [Competitiveness Development Foundation]. The goal of the foundation is to lobby for the interests of real estate and banks, which benefit the most from the residence permits. At that time, it was headed by Latio owner Šīns, but contributors to the foundation include the family of ex-Prime Minister Andris Šķēle, millionaire-businessmen Guntis Rāvis, Jūlijs Krūmiņš, the Rietumu Banka and others, as shown by the foundation’s annual report. The lobby has significant political support from some who benefit personally. 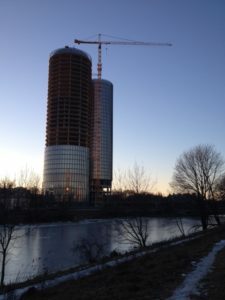 Those who made money from selling property to people who later applied for residence permits include former Minister for Culture, Žanete Jaunzeme-Grende; Bank of Latvia President Ilmārs Rimšēvičs; and the wives of European Union Commissioner and former Prime Minister Valdis Dombrovskis, his adviser, and the director of the state-owned railway, Latvijas Dzelzceļš. The interior minister’s business partner has been advertising the program in Russia. One discrepancy Re:Baltica uncovered is that the € 2.1 billion gains which Šlesers trumpets cannot be found in the Deloitte survey. The closest is the € 2.5 billion which is Deloitte’s estimate about the total five-year contribution of the program. Šlesers made his declaration after the program had run for three years. And Deloitte’s optimistic assumption has not materialized in reality. According to the Office of Citizenship and Migration Affairs’ (OCMA) data on investors, up until the October, 2014, the RP program had directly brought in € 1.26 billion (US$ 1.4 billion). Adding up direct and indirect income from the calculations provided by the Bank of Latvia, the contribution to the economy in 2013 was € 350 million (US$ 396 million) or 1.5 percent of GDP. The direct benefits are about 0.4-0.5 percent of GDP or about € 120 million (US$ 136 million) per year, of which € 30 million (US$ 34 million) finds its way directly into the state budget in the form of taxes and duties. The bank does not reveal what constitutes the rest, while “a special macro-model has been used” for the calculations. The Bank of Latvia emphasizes that the calculations relate only to 2013. The OCMA statistics show that the second largest number of RP applications since the commencement of the programme were made in that year. If the single year calculations from the Bank of Latvia were multiplied by five, and movements in the number of RP applications ignored, the total is still significantly smaller than in the Deloitte prediction. One of the few surveys, which analysed the programme’s contribution to the economy as a whole, was conducted by Canadian consultants Grant Thornton. It was commissioned by the Ministry of Economics, but paid for by the foundation headed by Šīns. First, the consultants interviewed the leading employer and local government organizations, asking what was the main goal of the programme. When it was introduced in 2010, one of the main aims was to revive the real estate market which had practically died during the global economic crisis, in hopes of brining money into the economy. Research indicated it was a worthwhile short-term goal but it should not continue over a long period, as the nation’s economy would get used to the easy money and become overly dependent on one sector—construction. Respondents said the main goal of the program should be the development of existing and new businesses, and the creation of new jobs. Support for the real estate sector was secondary. That’s not how it worked out. Although it is possible to obtain a RP by putting 280 000 euros in a bank deposit or investing a minimum of 35 000 euro in the company (with conditions on the size of company and amount of taxes to be paid annually), eighty-three percent (about € 1 billion or US$ 1.13 billion) of the investments ended up in real estate, 12 percent in bank deposits and about 5 percent was invested directly into the companies. The Bank of Latvia, which wants to revert to the lower ceiling for the property price to obtain RP for a few years to stimulate the cooling economy, points to the same risks. By concentrating on the residence permits in real estate for an extended period, economic activity and employment is increasingly diverted to this sector, taking these away from others, for example, manufacturing. Conclusion: compared to other countries, it is not. Prior to the changes in Latvia’s program, it was the cheapest in the European Union. Since the minimum was increased to € 250,000, it is still cheap—Latvia and Greece require the lowest outlays in Europe. Currently, two proposals are submitted for the discussions in Parliament. Both of them envision dropping the minimum for Latvia. The first would lower the threshold to between € 50,000-180,000 (US$ 56,000-203,000) for three properties, depending on their location, which was submitted by Valmiera’s former mayor, Inesis Boķis of the Unity party. The second would require € 125,000 (US$ 141,000) for three properties outside of Rīga, but € 250,000 (US$ 282,000) for three in Rīga, which was submitted by a different member of Unity, Vilnis Ķirsis. Ķirsis does not provide any justification for the amount, saying he submitted it to promote discussion. “I won’t pretend to you — the Employers’ Confederation of Latvia (ECL) and Major Cities Association asked me to submit it as they couldn’t themselves,” Boķis told Re:Baltica. It is unclear who came up with those numbers, or how they were calculated. Former member of Parliament Viktors Valainis, now the chief RP lobbyist in place of Šīns, points to the ECL. The ECL representative on this issue, Mārtiņš Bičevskis, says that he doesn’t know. Šīns is equally vague. The research by Grant Thornton did not recommend different thresholds based on location, because then only specific municipalities would benefit. The Canadian consultants recommended the creation of an Economic Development Foundation in which each purchaser of a residential permit would contribute € 43,000 (US$ 48,000) to be invested in specific goals, such as support for small businesses or large public projects. A smaller sum was determined instead: 5 percent from each RP must be paid into specific funds, and part of it goes to the support of the young families looking for their first home. Conclusions: the earnings of large builders and developers are under threat, as a string of projects were built with rich foreigners seeking residence permits in mind. But the drop in applications for permits is due not just to higher costs but also to the sharp decline in the value of the Russian ruble. From September 2014, when the higher price for residence permits kicked in, 67 permits have been issued. Prior to this, there were, on average, 228 per month according to data from the OCMA. The Chinese, who together with the Ukrainians formed the second and third largest groups, have disappeared completely. According to the industry’s estimate, 60 to 70 percent of the apartments in new projects in Rīga were purchased by non-residents. Last year, there were about 15 such multistory apartment building projects at various stages of construction, in addition to those already constructed. 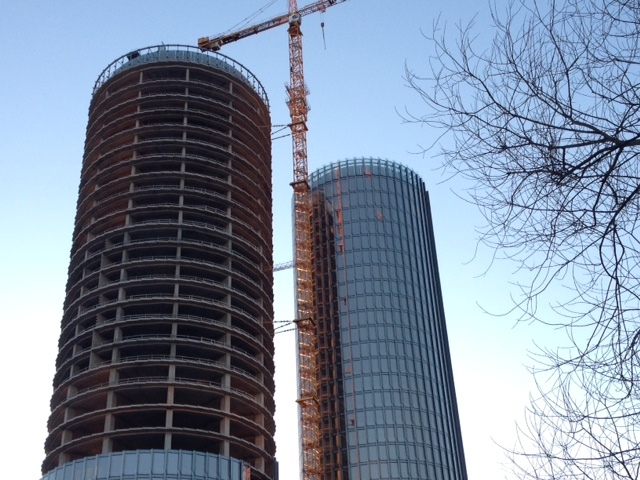 The sector estimates that the number of apartments sold in Rīga per month has dropped so sharply that, at this rate, it would take 30 years to sell Z-Towers (pictured), owned by the company of Jurijs Šeflers, Russia’s spirits millionaire. Valainis says that about € 200 million (US$ 226 million) invested in multiunit projects that have or will be constructed is at stake. Conclusion: at this stage unemployment statistics don’t confirm this, but it is unclear what might happen in the future. “I wouldn’t want to tolerate people losing employment again due to the abolition of RP, and that they’d have to move to Italy, France, Great Britain or Russia to work,” said Igors Buimisters, the millionaire and Chairman of the Board of Trasta komercbanka. He voiced his concerns for everyday folk in a series of articles in the Latvian daily newspaper Diena which is controlled by Šleser’s pals. The real estate company associated with his bank is currently selling apartments in five new multi-apartment building projects. “An opportunity for the country to gain income will be destroyed without providing anything in its place. The nationalistic politicians’ (plan) is for Latvia to remain as some kind of Indian reservation, living off European benefits?” asked indignant architect Andis Sīlis, who is working on the interior of Z-Towers, in that same series of articles. The letter goes on to predict that 5,500 people will lose their jobs in the future, as result of which the nation would lose € 110 million (US$ 125 million) in unpaid taxes. In the Diena series, Jūrmala Mayor Gatis Truksnis said 22,000 construction workers are already working solely on RP projects. The Bank of Latvia also supports this view. In a blog, it points to the increase in the number of construction jobs as a positive contribution of the Golden Visa program and says it also creates employment in “less directly connected sectors – nannies, security guards, chauffeurs et al.” All of these additional jobs mean people can stay in Latvia or return from working abroad, the blog continues. State Employment Agency data shows that at the end of 2014, when the program was already in slow motion, the number of registered unemployed associated with construction had not increased, but decreased (when compared with the same period the previous year – 4,559 compared to 4,855). “I can’t comment on income from tax, as I don’t know how this is calculated. But the assertion that ‘most likely, 5,000 families have already ended up without an income,’ is without doubt an exaggeration,” says Alfs Vanags, the head of BICEPS Economic Research Center. The Re:Baltica investigation revealed that nearly 40 percent of high-end properties purchased in 2014 were bought by locals. Specifically, there were 608 property transactions exceeding € 250,000 (US$ 283,000) between November 2013, when the Maidan uprising began in Ukraine, and September 2014, when the RP threshold was increased. Of these, 234, or 38 percent, were local. Another issue is what the proposed drop in the RP threshold might do to home prices. Those backing a threshold of € 60,000 (US$ 68,000), such as Valainis, say this wouldn’t affect locals as most applications for the state-guaranteed First Home program are for apartments worth € 40,000-45,000 (US$ 45,000-51,000). (As the name indicates, the program seeks to help young families buy their first homes). This is yet another half-truth. Baiba Tētiņa, who handles First Home applicants for Banka Citadele, says that 20 percent – one in five – is trying to buy a home that costs more than € 60,000. Valainis’ second argument is that allowing foreigners to buy smaller and cheaper apartments will strengthen the rental market, noting that already many of the properties bought for residence permits are rented out to locals who can’t afford to buy them due to the high prices. Oksana Bratislavskaya says that when they bought their flat, the building manager offered to manage the flat and find tenants in exchange for 5 percent of the rent. The manager had signed similar contracts with other apartment owners who had gained Golden Visas. Morten Hansen, the Head of Economic Studies in the Stockholm School of Economics, told Re:Baltica that there is no doubt the investor program influences the price of real estate. “In my opinion, this is the greatest nonsense about it – that local residents will not be able to afford to buy property due to the price and are forced to rent them. Civilized countries shouldn’t function like this,” he said. Conclusion: this depends on the point of view of the person making the judgment. 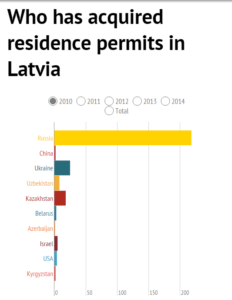 Latvian security services have limited knowledge about profiles of specific immigrants. Investigating the previous lives of investors or the sources of their money did not have a high priority until the annexation of Crimea, based on staffing patterns at the Security Police. Before Crimea only one person checked investor backgrounds; since then four more have been assigned to the job. Police say the risk of criminal elements is small, while money laundering or hiding money exists. In a number of cases, former bankers who are being sought or their families use the residence permits issued by Latvia to live in Europe, or to hide money in Latvia. Security experts say they are concerned about how well the arriving Russians will assimilate in the local community, noting a high proportion of Russian-speakers may encourage the development of a parallel Russian-speaking society. Jānis Bērziņš, a security expert at the Latvian National Defense Academy, explains that the Latvian nation is small, and therefore a large influx of foreigners can become a threat.